In another exciting day of post-season racing, Exeter’s girls’ eight took first place in the Women’s Junior Eight event at the Reading Amateur Regatta in Reading, England. The Regatta, founded in 1842, consists of dual-races along a 1500 meter stretch of the River Thames. Due to the limited number of lanes, the nine girls, Hannah Woodruff, Allison Courtin, Rory Erickson-Kulas, Katrina Regan, Lizzy McDermott, Erin Metcalf, Rebecca Kisner, Nancy McKinstry and Catherine McDermott, raced three times in one day as they progressed through the single-elimination bracket. In their first race, they beat Tabor Academy (of Marion, Massachusetts) by a half-length of open water. 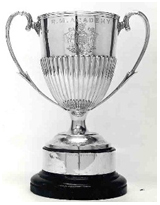 In the second round, the eight defeated Headington School (of Oxford, England) by over two lengths of open water. In the finals, the girls beat Molesey Boat Club (of Molesey, England) by over a length of open water. 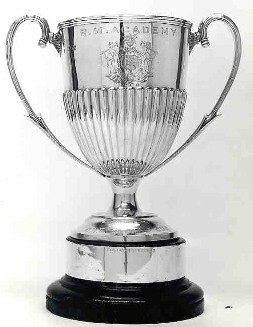 This victory also means that Exeter was awarded the Royal Military Academy Challenge Cup, pictured right. Check out the videos section to see film of the eight in the semi and grand finals. Exeter’s four, consisting of Andrea Nortey, Kate Morris, Anna Johnson, Catie Lucy, and Jess Flakne, raced well in the Senior 4+ (coxed straight four) event but lost by two lengths in their first race to Newcastle Univserity Rowing Club. Despite this loss, they performed exceptionally well considering the age difference between the two crews. Godspeed girls as you train for the Henley Women’s Regatta next weekend.